Very quick post today as I am feeling very lazy and lethargic. It’s just getting hotter and hotter since typhoon Neoguri made its way painfully slowly across Japan, and my determination not to use the air conditioning at home until August is waning with every passing day. So far I’ve been able to manage by just sitting with the fan on full blast while it is directed at my face, but it’s getting harder, in the day time at least. 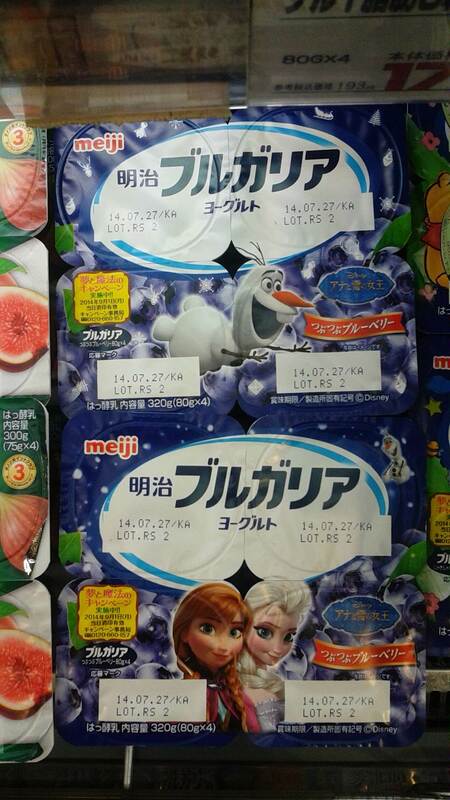 So, I was in the supermarket the other day, and saw these very cute Frozen yoghurts! Meiji’s Bulgaria blueberry yoghurt has had a revamp – hilarious! If I put them in the freezer I’ll end up with mini Frozen frozen yoghurts – how meta! Frozen (Anna and the Snow Queen in Japanese) has been SO popular over here. It has been all over the world I suppose, but to the extent of having the characters adorning yoghurt pots, I’m not so sure. The last few times I’ve been out dancing (read clubbing in Dogenzaka) they’ve played remixed techno house type versions of “Let it go,” and everyone sings along. It is quite an experience! I haven’t even seen the film yet, but I definitely want to. Maybe watching it will help me beat the summer heat. Wishing you all the most wonderful week ever! I don’t understand the Frozen hype. It’s along the same lines as Brave and that was Pixar’s worst. No imagination…just same old princess plots and evil things. I think I smiled weakly twice; no real jokes. There have been diseases cropping up of children avoiding going out b/c they WILL be bombarded with Frozen advertisements, lol. To get your own credible opinion on something this popular, watch it and try to block out all the box office sales numbers ;). I really hope your fro yo tastes better! It looks cute–what flavor? Ha ha you’re the first person who’s been meh about Frozen 🙂 It’s good to get lots of opinions. I’n sure I’ll enjoy Frozen, but if I decide it’s just the most awesome thing ever I’m sure I’ll come back to this and leave you a comment, ha ha. It’s blueberry 😀 Quite yum! As a joke I had to put up a “Let It Go” hadn’t been sung in x days sign because it’s everywhere. It’s never got off zero! How on earth do you manage without air conditioning?? I hope you manage to stay cool! And yes, I want to build a snowman. I haven’t even seen this movie yet. But there seems to be a great hype around it. I haven’t seen anything in supermarkets with the characters from Frozen on them, but the game Angry Birds is still a big thing here and printed on almost EVERYTHING. Funny is that I haven’t even played this game. xD Have you? I actually saw Frozen closeish to when it was released and enjoyed it, but no fireworks. I mean, Olaf is cute (you’ll see.) and that’s pretty much it. It’s a fun movie if you like Disney, but for me, Brave and Tangled were MUCH better. Of course I did! How could I not, the music, the landscape, the bouncy hair and bear cubs?! The story was very old school Disney and I liked it for it!